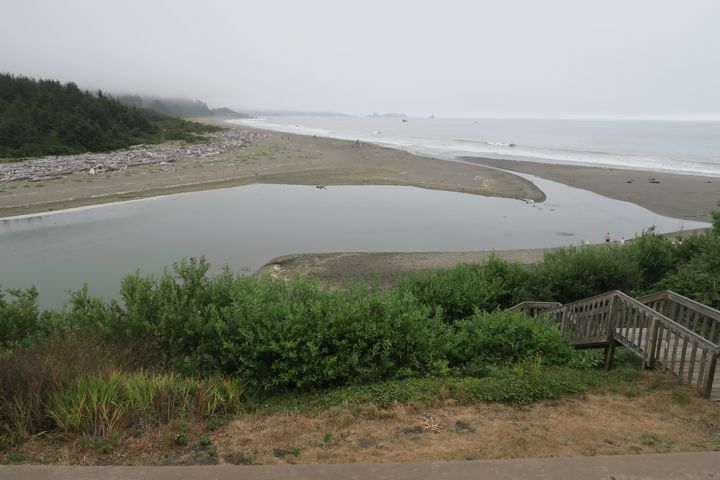 Surprisingly early start and north through coastal fog – briefly sunny inland, but back to the fog in Eureka, where we had most of an hour to walk in Old Town before our Servas interview in Arcata. 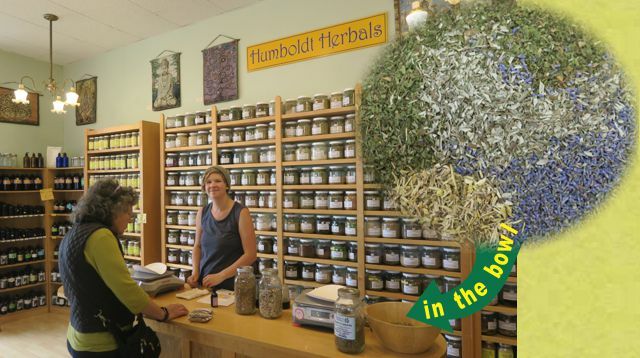 Found a neat herb store where the cheery herbalist helped us find what we wanted. 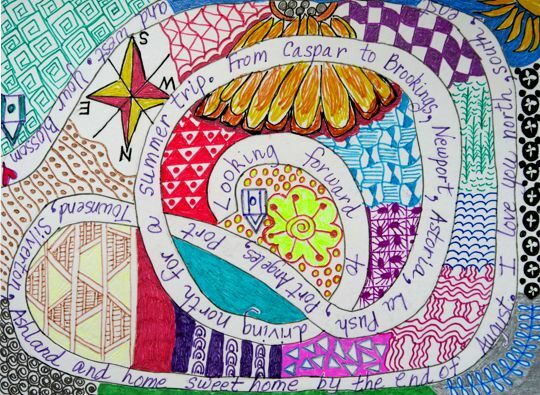 Into Arcata and a light lunch with two dedicated Servas folks – if you don't know about Servas traveling, look it up! The headquarters of US Servas happened to be just down the road, so our interviewer led us down there and got us documented, so we're ready to be Servas travellers again for our next major trip. 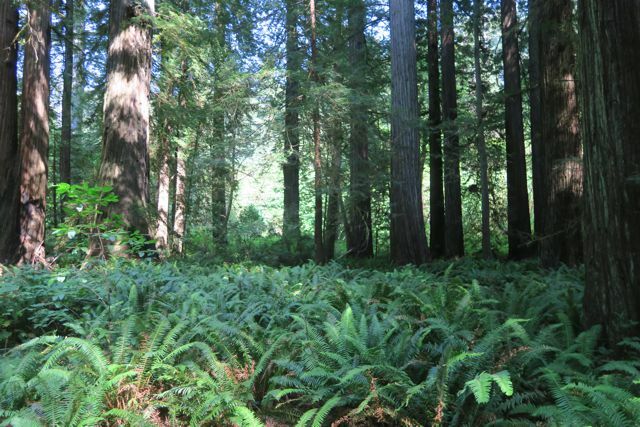 Onward through the majestic Redwoods in Redwood National and State Parks. After navigating past the cars and gawkers watching the Elk sleep in a meadow (no picture) we took our usual long, slow ride through Prairie Creek Redwoods. It's hard to explain the scale of these trees. I feel like an ant crawling through the grass ...even if other ants have prepared a paved pathway between the stalks. 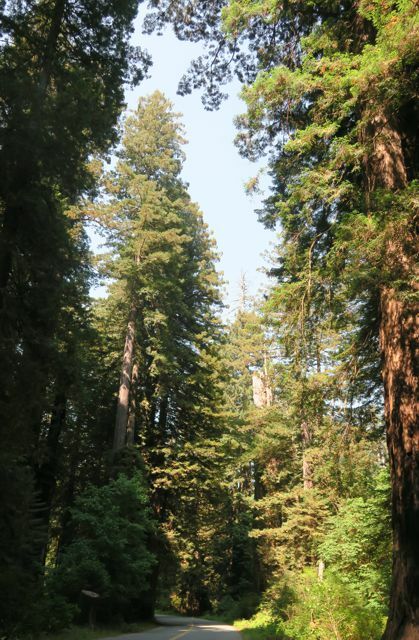 I never fail to wonder at the wisdom of our Californio forebearers, who (unlike the New Zealanders) kept these awesome first-growth stands unmolested, for our grandchildren to admire. Highway 101 swoops our east of the Park, and 99% of the traffic whizzes competitively past. In among the giants, I appreciate the way the folks slow down ...and wonder along with us. Over the Klamath River, on of the rivers that the current repuglicant administration claims 'wastefully diverts water into the ocean.' I think the Salmon disagree. 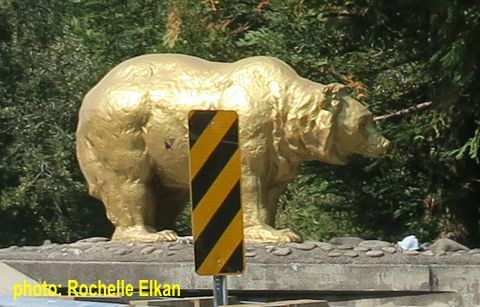 I always wanted a picture of the Golden Bears at the corners of the Klamath River bridge, and this time construction on the bridge slowed us down enough to get a quick snap; road sign at no extra charge. Goddess Nose, we must always keep safe! A walk on the beach, then into town for a good dinner at Pacific Sushi, then home for another walk on the beach. 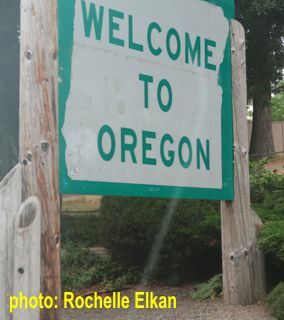 This part of Oregon continues the pattern of subduction that rules our North Coast ...but the land here is older and more dominated by big, wild rivers. 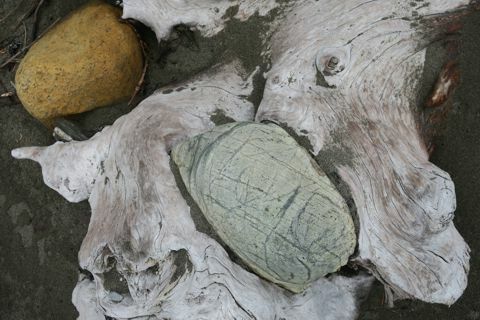 The beaches are covered with cobbles of amazing diversity, alongside monstrous tree-bones that have been wrested from the riverbanks, sometimes with rocks still in their grasp. We'll probably get one more beach walk in tomorrow morning before heading out (for breakfast) and up the coast to a long-anticipated dinner.